Have you been dreaming of owning an electric bicycle, but cannot seem to afford one? Well, you need not worry now as Stark Drive is now turning that dream into reality. Let’s face it — these electric scooters and bike typically cost an arm and a leg. To change that, the said firm is releasing a game changer without blowing a hole in your pocket. While conventional bikes are still around and highly functional, we cannot discount the fact that the needs of the commuters are changing over the year. Therefore, preference to smaller, lighter, and inexpensive mode of transport become apparent. Changes have become apparent over the last few years and these have affected the choice of transport of many people – including the need for an electricity-powered vehicle. For instance, more and more people tend to live in a compact area due to the skyrocketing cost of living. Many also opt to live close to their workplace is save on commute time and expenses. Changes in urban designs have also called for changes in commuting and transport behavior. With the current shift in these living and transport needs, it is imperative for companies to offer options that would perfectly suit the needs of the commuters. So, the question now is – are you ready to grab one of those cheap saddles? 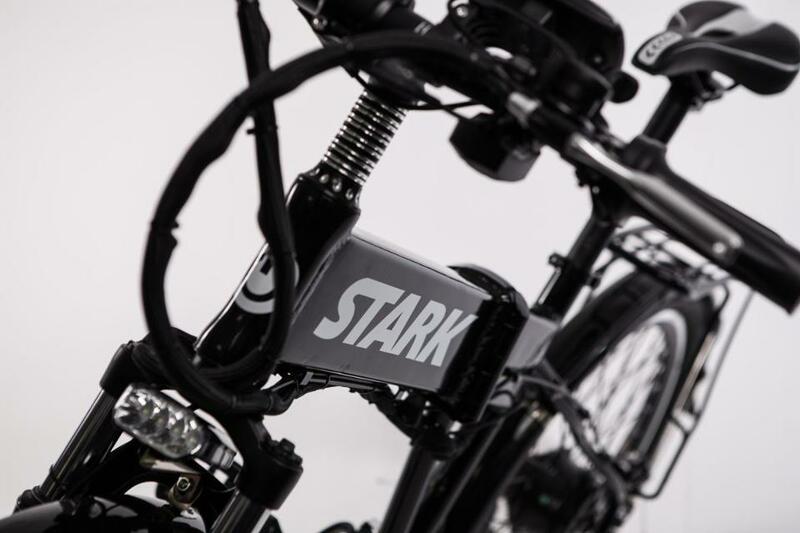 How Cheap is the Stark Drive Electric Bicycle? Less than $400 per unit – yes, $399 to be exact. This is how affordable the e-bike is. This new entry promises to provide bikers and daily commuters the same experience as they would on full-sized electric bikes. There are high-end bikes today that cost as much as a second-hand car. You can encounter some e-bikes that are way too bulky. For the price of $399, this bike really is the cheapest one available on the market today. No need to splurge on extremely expensive electric self-balancing scooters or even on a car. This highly affordable electric bicycle can take you from point A to point B without any problem or the extra expenses on gasoline or parking fees. Note that the retail price of the bike cost around $1000 – still not as expensive as those that bear high-end brands. But why spend a thousand when you bring home at 60% off? These days, being practical is the key. As you grow older, riding a bike tends to become more like a job than a leisure activity. You get all sweaty in pedaling, you find it more difficult to park it in a safe area, and you need somewhat a big space to store it in. These have just been proven wrong by the people behind the Stark Drive Electric Bicycles. There are just a plethora of reasons as to why you should own an e-bike. For one, this particular battery-powered bicycle is foldable. You can fit it in the truck of the car, carry it in public transits, store in a small space at home – the compact size and the lightweight make it one of the most portable vehicles today. Although this bike has just been recently launched via Indigogo campaign, the slots are getting filled out at a rapid rate. The number of people and backers of this particular product have made it too easy to reach the goal. In fact, the amount has reached four times the target or goal. If you haven’t signed up yet, you need to do it immediately as slots as running out. So, what exactly does this affordable electric bike look like? Read on and discover. The frame is made from Aluminum Alloy 6061 that come in either matte black or white. It is also possible to upgrade the frame and include a rear cargo rack and a limited edition system for security ad locking. You cannot go wrong with the hardware as well. Firstly, it has a quick release saddle and folding paddles. For safety, the bikes come with LED Headlights. You can use it in chauffeur mode when if you want to be on the go while the e-bike is folded. It also comes with an integrated foot stand, integrated USB, and can accommodate a total weight of 150 kg of a load. You may also get the unit with rear suspension as one of the upgrade options. All Stark Drive electric bicycles are weatherproof and come with LED PAS of 3 different Assist levels. There is also a backlit display and you are free to modify the maximum speed depending on your personal preference. Buyers of the bike are also provided with upgrade options including the installation of integrated throttle and the inclusion of a speed or odometer. The types of wheels used in electricity-powered vehicles are also paramount to boosting the riding experience of an individual. This foldable electric bike comes with a 26” Front and Rear pneumatic Tires in anthracite black color. These wheels are designed to give the best traction grip making this unit ideal for use both on the road and off the road. The safety features of this bike can also be seen on the carbon disc brakes located on the front and the rear. This particular e-bike is equipped with geared hub motor of 36V 250W. The design of the motor as been patented by the manufacturer. To those who are willing to spend some extra cash, they may opt to have the Throttle option or the 36V 250W motor option. That’s one of the great things about these electric bicycles – you actually have the flexibility to upgrade certain components to suit your needs. Yes, the final outcome depends on how much you are willing to spend on your ride. If you only got a few hundred to spare, that is not a problem at all. This electric bicycle certainly fits the bill. In all electric bicycles, the battery system is often referred to as main ‘soul’ of the model. This particular e-bike can be bought with two different battery options One with Standard Battery 9Ah 36V or the upgraded one with 13Ah 36V. The batteries are certified safe and regulation compliant. They are developed and produced by Panasonic. Another interesting feature of the battery is the hidden charging port, the key port, and the lock system that comes with a key. Charging period and the maximum drive range depends on the capacity of the chosen battery plus the type of motor used. This e-bikes can be used to a maximum speed of 20 mph without having to manually pedal it. As per the tests were done in this model, bikers can travel up to a maximum of 65 miles (100km) on a single full charge. When the upgraded battery system is chosen, the electric bicycle can cover a maximum 20-km drive range. The battery is completely detachable and you can purchase an extra if you intend to go on a long leisurely ride with a friend. Just be mindful on how you take care of your batteries. Electric vehicle batteries, as a whole, tend to deteriorate when exposed to extreme weather conditions and over a period of time. Having to drive an electric vehicle does not only provide long-term saving but also helps in drastically lowering the CO2 emission on the road. This is one of the most important reasons as to the electric vehicle industry continues to grow at such a rapid rate. People are becoming more keen on selecting economical and eco-efficient means to move around. So, are you now excited to get your hands in one of these electric bicycles? Become one of the owners by signing up today. Note also that the price indicated on their website does not include the shipping fee, so you may need to set aside a couple of hundred bucks. Lastly, enjoy riding your electric bicycle soon.